On December 11, Kushwaha had severed his ties with the BJP and tendered his resignation accusing Prime Minister Modi of reducing the cabinet to a “rubber stamp”, “betraying” backward classes and giving Bihar only “jumlas”. New Delhi: Upendra Kushwaha-led Rashtriya Lok Samta Party (RLSP) joined the UPA fold on Thursday following a series of talks with the Congress and Lalu Prasad’s Rashtriya Janata Dal (RJD) leaders. The announcement of Kushwaha joining the ‘mahagathbandhan’ in Bihar was made at an All India Congress Committee (AICC) press conference in the national capital. “We had said that we have many options and UPA was one of them. The wholeheartedness shown by Rahul Gandhi and Lalu Yadav is one of the reasons I joined but the biggest reason I’m here is the people of Bihar,” ANI quoted Kushwaha as saying. The former Union minister’s joining the UPA is likely to give a boost to the formation of a grand alliance in Bihar to counter the NDA combine of Bhartiya Janata Party-Janata Dal(U)-Lok Janshakti Party. “Kushwaha has already held talks with top Congress leadership and his joining the UPA fold is only a formality now,” a top Congress leader, who was part of the talks, was quoted as saying in a PTI report. On December 11, Kushwaha had severed his ties with the BJP and tendered his resignation accusing Prime Minister Narendra Modi of reducing the cabinet to a “rubber stamp”, “betraying” backward classes and giving Bihar only “jumlas”. 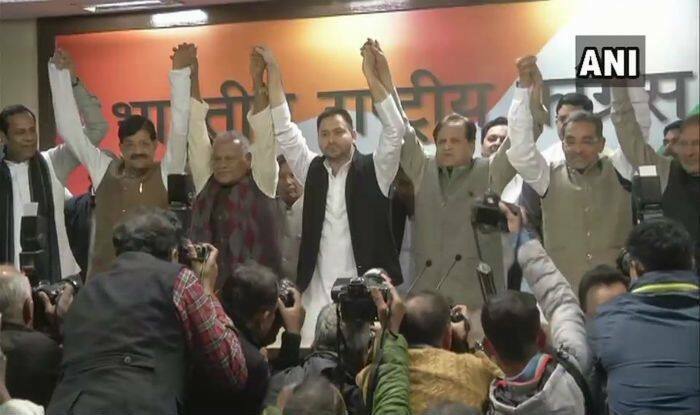 The Congress, Rashtriya Janata Dal, former Bihar Chief Minister Jitan Ram Manjhi-led Hindustani Awam Morcha (Secular) are already part of the United Progressive Alliance (UPA) and are seeking to give a fight to the National Democratic Alliance (NDA) in the Lok Sabha Elections 2019. The saffron alliance had swept the Lok Sabha elections in 2014, winning 31 of the state’s 40 seats.